Stormwater is rainwater and/or melted snow that does not infiltrate into the ground, but instead becomes surface runoff. In natural systems, stormwater is the lifeblood of the river. Some soaks into the ground, refilling ("recharging") the aquifers and maintaining groundwater levels. Groundwater then feeds clean, cold water to the river and its tributaries throughout the year until levels naturally recede. Stormwater that does not immediately soak into the ground either evaporates, or is filtered through vegetation and runs into surface waters. Unfortunately, stormwater in most cities and towns does not mimic the natural system. In urban and suburban areas, stormwater picks up pollutants such as sediment, road salt, heavy metals and motor oil from roads and parking lots; pesticides, fertilizers and bacteria from agricultural lands, golf courses, landscaping, and yards. That pollutant laden water then travels down a path over impervious surface to the local storm drain and is dumped directly into our rivers, lakes and wetlands. State and federal regulations aim to decrease stormwater pollution through the NPDES discharge permits under the Clean Water Act. The Stormwater Community Assistance Program of the SuAsCo Watershed Community Council provides outreach materials to municipalities to address two of the six minimum control measures under the Stormwater NPDES Phase II Regulations: Public Education & Outreach, and Public Participation & Involvement. Many communities are also putting local stormwater bylaws in place. The Commonwealth’s Nonpoint Source Pollution webpage contains links to key materials and resources on stormwater management. There are many things that can be done by residents, commercial and residential developers and property owners and municipal officials to recharge stormwater and prevent pollution. Another resource is the Massachusetts Watershed Coalition, a network of watershed partners working to improve how communities manage stormwater. Low Impact Development techniques are revolutionizing the way we think about managing stormwater all over the country. LID is an alternative and cost effective way to design and build projects that mimic natural systems to filter and recharge stormwater on site. 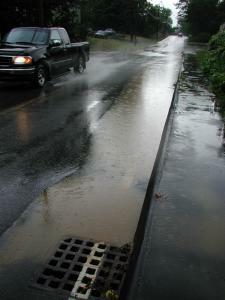 Municipalities can make a big impact in managing stormwater by adopting LID Stormwater bylaws. Home and business owners can choose from a beautiful and effective array of pervious pavement options for driveways and sidewalks, build rain gardens into their landscaping designs, disconnect roof drains and even install a green roof! Architects and builders are increasingly offering LID services. If you are thinking about renovating your home or business, or thinking of building new, ask about Low Impact Development. The Metropolitan Area Planning Council has a Low Impact Development Toolkit. The MA Smartgrowth/Smart Energy Toolkit has excellent descriptions of LID techniques such as rain gardens, green roofs, pervious pavement and more as well as example LID Bylaws. The Stormwater Center at University of New Hampshire is a research hot spot for LID techniques for use in a New England climate and runs excellent workshops on the results. Closer to home, the Acton Discovery Museums have an LID demonstration of permeable paving, rain barrels and raingardens. The Assabet Groundwater Recharge Fund established by Intel Massachusetts has helped towns in the watershed to install stormwater recharge systems.